Houston is the fourth largest city in the United States and the largest in Texas with around 2.3 million people living in the city and almost 6 million in the metropolitan area. 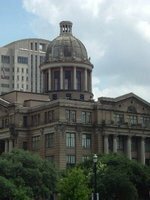 Houston was founded on August 28, 1836 near the banks of Buffalo Bayou (now known as Allen's Landing) and incorporated as a city on June 5, 1837. The city was named after former General Sam Houston, who was president of the Republic of Texas and had commanded and won at the Battle of San Jacinto 40 kilometres east of where the city was established. The burgeoning port and railroad industry, combined with oil discovery in 1901, has induced continual surges in the city's population. In the mid-20th century, Houston became the home of the Texas Medical Center—the world's largest concentration of healthcare and research institutions - and NASA's Johnson Space Center, where the Mission Control Center is located. Downtown - Downtown feels very empty if you explore it on foot at street level. Even during the usual lunch break there aren't very many people about. This is because the skyscrapers which are home to many of the large companies in Houston are all connected via an underground, air conditioned tunnel system. Houstonians are very proud of The Tunnels which mean that during the hot and humid summer months there is no need to go outside at all. The first 10 or so stories of the skyscrapers are car parks, so commuters can drive into their office building, work, go to the Tunnels for lunch and leave at the end of the day never having left the comfort of air conditioning. Galleria - This is the other major business district in Houston, slightly to the west of the centre of the city. Texas' largest mall, The Galleria (which includes an ice rink) is the centre of this district. Many hotels and offices can be directly accessed from inside the Galleria mall. Montrose - This is the old residential centre of Houston and is charaterised with mature trees along the roads and a mix of large houses, two-story apartment complexes and bars. It is the gay district of Houston, and the annual Gay Pride Parade and Festival is centred around the crossing of Montrose Boulevard and Westheimer. There are many thrift stores, tattoo palours, psychics and eclectic eateries scattered between the US 59 at the south and Buffalo Bayou Park to the north of this district. The Heights - The Heights are north of the Buffalo Bayou Park which runs West to East along Allen Parkway into downtown. As Montrose became increasingly expensive, many artists moved out of Montrose and into the Heights. This is also a leafy part of the city, relatively central with many one-family homes on plots with front and back yards. Space Center Houston is the official visitors’ center at NASA's Lyndon B. Johnson Space Center. You will find interactive exhibits, a shuttle simulator and numerous presentations detailing NASA's history. The Theatre District - This is at the north end of downtown and home to the numerous theatres in Houston. There are full time Theatre, Opera and Ballet companies as well as a Symphony all of which perform within this district of Houston. Off-Broadway shows frequently come for three to six month residencies as well. Houston Zoo within Hermann Park, houses over 4,500 animals divided over 900 species. The Galleria is Texas' largest mall. Enjoy some sporting action while watching the Houston Astros (MLB), Houston Rockets (NBA), Houston Texans (NFL) or Houston Dynamo (MLS). The Museum District - This is north and south of the US59 roughly along Montrose Boulevard. To the north of the US59 in Montrose is the Houston Centre for Photography, the Rothko Chapel and the Menil Collection. The latter two are free to visit. South of the US59 are the Museum of Fine Art, the Museum of Natural Science and 14 other museums, all of which are listed at the Museum District Association. Most museums have one day or afternoon a week when entrance is free. The Space Center on NASA Rd. 1 used to have a Saturn 5 rocket visible from the road. Because of rust problems they built a hudge building covering the rocket and did a renovation on the Saturn 5 rocket. The Houston Livestock Show and Rodeo is held over 20 days from late February to early March. The Houston Pride Parade is a night-time gay pride parade held each year in June. Houston has a humid subtropical climate, with occasional tornadoes in spring. Prevailing winds from the south and southwest bring heat from Mexico's deserts and moisture from the Gulf of Mexico. In summer, temperatures regularly reach over 32 °C with an average 99 days a year. The humidity of the area results in an even higher heat index than the actual temperature. Winds in summer are often light and bring little relief. Air conditioning use in Houston is very heavy to cope with the high temperatures. Winters are quite temperate with an average high of 17 °C in January, the coldest month. Snowfall is rare. Houston receives a high amount of rainfall each year, averaging 1,200 mm annually. The rains frequently cause flooding in parts of the city. The George Bush Intercontinental Airport (IAH) is Houston's primary airport and the 9th largest in the US in terms of total passengers. It is the headquarters of Continental Airlines and its largest hub. It's located about 20 miles (32 kilometres) from downtown Houston. Bus: The Metropolitan Transit Authority of Harris County, Texas, or METRO, offers bus service available at the south side of Terminal C. The 102 Bush IAH Express and the METRO Airport Direct serve the airport. Shuttles: Regularly scheduled bus and shuttle service go to locations from IAH to Reliant Park/Reliant Astrodome, Downtown Houston, Uptown, Greenway Plaza, the Texas Medical Center, Westside hotels, the city of College Station and William P. Hobby Airport. Super Shuttle also provides service from George Bush Intercontinental Airport to the surrounding communities via shared vans. Taxis and vans also are available and there are plenty of options to rent cars. The William P. Hobby Airport (HOU) is Houston's second largest airport and mainly operates small to medium-haul flights. It is the only airport served by Southwest Airlines and JetBlue Airways. Amtrak stops in Houston along the Sunset Limited route from Los Angeles to New Orleans. The station is on the north side of the downtown area. Houston is well connected to the rest of the state and country by many freeways/interstates. Greyhound Bus Lines have intercity services from 5 stations in Houston and Houston suburbs. Other bus lines also operate from Greyhound's stations. Currently, public transportation in Houston is limited to METRO, which operates bus lines as well as the new and very popular light rail line called METRORail. METRORail is a seven and a half mile light rail line that runs between downtown, midtown, the museum district, the Medical Center, Reliant Park, and the Fannin South Park & Ride (which is a handy place to park and is located near the 610 loop). It costs US$1.25 for a one-way ticket. The Saint Arnold Brewery - Billed as Texas' oldest microbrewery. Their brews are often sold in local bars. Very popular beers are the Texas Wheat, Oktoberfest (August through October), and Christmas Ale (November through December). The brewery tour is open Monday through Friday from 3:00pm to 4:15pm, and Saturday 11:00am to 2:00pm. Karbach Brewing Co, 2032 Karbach St. Near 290 and 610, built in 2011. Beer Garden/patio is open M-F 2:30 to 9:00, Sa noon - 9PM and Sunday noon - 5:30PM. It is also building an expansion of the brewery and a restaurant/brewpub. Buffalo Bayou Brewing Company, 5301 Nolda St. In the Washington Corridor. Focused on their Witbier recipe and interesting variation of that. Tours/tasting hours Saturday Noon to 3PM. 8th Wonder Brewing Company, 2202 Dallas St. In EaDo near BBVA Stadium. Taproom open Th F 5 - 10PM, Sa noon - 8PM, Su noon - 8PM. Great for a few beers before a Dynamo game away from the crush at Lucky's and Little Woodrow's. Club Quarters, 720 Fannin St. This hotel is private and club-like but it has 24 hour room service and it accommodates your needs, for example there are state of the art televisions. Courtyard by Marriott Houston Convention Center, 916 Dallas St, ☎ +1 832 366-1601. Check-in: 3PM, check-out: noon. $189-$239. Houston Downtown Residence Inn, 904 Dallas St., ☎ +1 832 366-1000. Check-in: 3PM, check-out: noon. In the historic 1921 Humble Oil Building. Offers free shuttle to George R. Brown Convention Center and Minute Maid Park. $199-$329. Four Seasons Hotel Houston, 1300 Lamar St, ☎ +1 713 650-1300, fax: +1 713 652-6220. In 2006 this luxury hotel was ranked as one of the "Top 100 Hotels in the World" according to Institutional Investor and offers great restaurants and amenities to guests. It is also within walking distance to the Houston Center Athletic Club - great for that morning workout before business. Hotel Icon, 220 Main St (Congress St.), ☎ +1 713 224-ICON (4266). This boutique hotel features award winning dining, extensive meeting facilities, and a luxury day spa. Magnolia Hotel, 1100 Texas Ave, ☎ +1 713 221-0011, fax: +1 832 201-7598. This downtown boutique hotel offers accommodations for leisure travel and extended stay guests, as well as space for meetings, wedding receptions, conferences, and special events. Hostelling International Houston (Morty Rich Hostel), 501 Lovett Blvd (at Whitney), ☎ +1 713 636-9776, e-mail: houston@hiusa.org. Located in a 1917 mansion built for one of Houston's former mayors. Regularly hosts pub crawls, museum tours, travel classes, and Texas sized BBQ's in the backyard. HI Houston is also the only hostel in the Hostelling International network with a swimming pool, to help escape those Texas summer days. Dorms $20+, privates $60. Robin's Nest B&B, 4104 Greeley St, toll-free: +1-800-622-8343. A quiet, snug little gem of a B&B, nestled only about two blocks off the main drag of Montrose Street. The innkeepers themselves speak a variety of languages which includes Portuguese, English, French, and Spanish. Pets accepted. $89-$240. Value Inn & R V Park, 9232 N. Hwy 146, Mont Belvieu, TX 77520, ☎ +1 281-576-6060. Check-in: 1PM, check-out: 11AM. This hotel is in Baytown. Downtown Houston is about 30 mins drive. Small but clean rooms with free wi-fi. Continental breakfast is served for $10. $75 - $100. La Colombe d'Or, 3410 Montrose Blvd, ☎ +1 713 524-8923. Intimately small luxury hotel in a 1920s era mansion. For travelers without budgetary constraints. modern b&b, 4003 Hazard St, ☎ +1 832 279-6367. This dramatic four-story bed and breakfast is a unique alternative with fab rooms, artists' works on walls, exercise equipment and shaded verandas that present panoramic views above the tree line. The innkeeper not only speaks English but German and Spanish as well. $100 - $225. The St. Regis Hotel, 1919 Briar Oaks Ln. We have a comprehensive list of accommodation in Houston searchable right here on Travellerspoint. You can use our map to quickly compare budget, mid-range or top of the range accommodation in Houston and areas nearby. This is version 41. Last edited at 10:21 on Jan 9, 19 by Utrecht. 143 articles link to this page.